Coding has been a hot topic in education lately and rightly so. It is an important subject. I was recently talking to a friend of mine who has to learn how to code because her job now requires it. More and more coding is becoming essential to any job of the future. The saying is so true we are training students for jobs that don’t even exist yet. Now it has taken me a while to get into the coding wave, per-say. The reason is that I have had a hard time figuring out how to fit coding into the curriculum. You see for me curriculum is and should the foundation for all of our learning and teaching. However, now that I have had some better understanding of coding I think I feel more comfortable incorporating it into my classroom. I am writing this post to share some of my learning and to share some of my big ahas. If you haven’t tried coding once then you may not see the potential that coding has for your classroom. Coding is amazing, I have always thought this. Coding is a built in problem. The very essence of coding is creating something from nothing. The Code that you write ends up creating endless possibilities. You are only confined by your imagination. So why code? Because it teaches students to problem solve, to be at a disequilibrium, to be collaborative and engaged with the 21st century learning (yes I know that many of you may not like that term). What programs are there for me to play with? There are a lot of programs to play and learn how to code. First and foremost I would suggest going to code.org as this is an amazing website dedicated to coding. I would also suggest connecting with Brian Aspinall (@mraspinall) and Lisa Ann Flyod (@lisanneflyod). Code.org has an app too. There are also many computer programs out there but one that I love is scratch. To be honest I just thought I would jump in but then had to rethink that plan as I really had no idea what I was doing. So the first step was coming up with an idea. At the moment we are studying measurement. I thought this would be a cool way to introduce coding and measuring concepts, especially non-standardize measuring. So my assignment was: Measure the span of your hand. Step 1: I allowed the students to explore the program of scratch. I think that it is important for students to explore the programs they are using, as they will do this anyways may as well give them time to do so. This process was amazing; however, it wasn’t until I tweeted our first program to a friend (Lisa and Brian) of mine that we started to see where we went wrong. This is also where I learned about adding variables to my code would help to improve it. To be honest I had no idea what variables meant. Don’t hold back because you don’t have a good understanding of coding. You will be surprised at what students can accomplish. 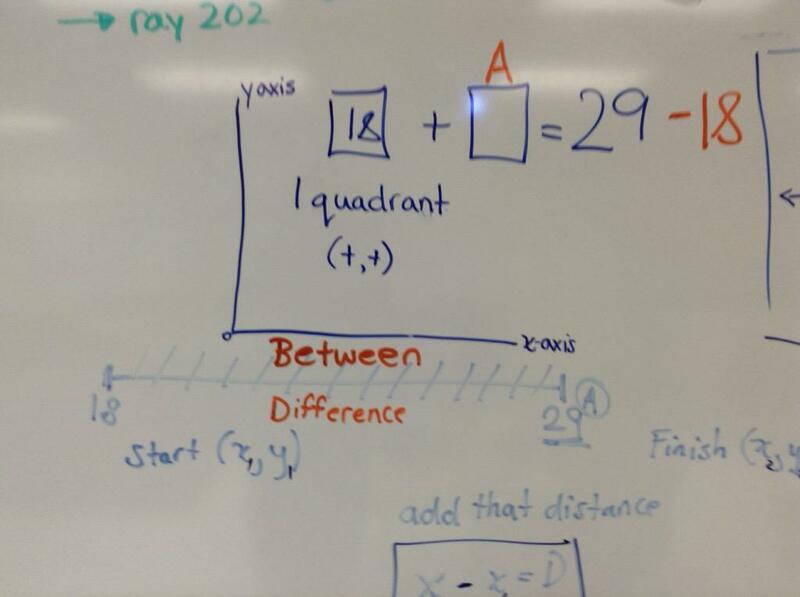 Often through this process I was learning and working on the problem along with my students. As the students or I made a finding we stopped the class and talked about it. We even shared the links and had students remix the code. Now make sure you have a plan of the big ideas in your mind. I often hear that these types of plans do not go well because the kids went wild or off task. If you don’t have a plan they will. Keep the curriculum in mind. 4) If at first you don’t succeed, try, try and try again. Coding is worth it. It is such a rich task with high possibilities. I have made a lot of mistakes with coding in the classroom but to be honest even those mistakes the kids learned a lot both curriculum and with coding. Overall, adding coding to my classroom was a lot of fun and so worth the struggles. The students are so engaged in the lesson and learned a lot. 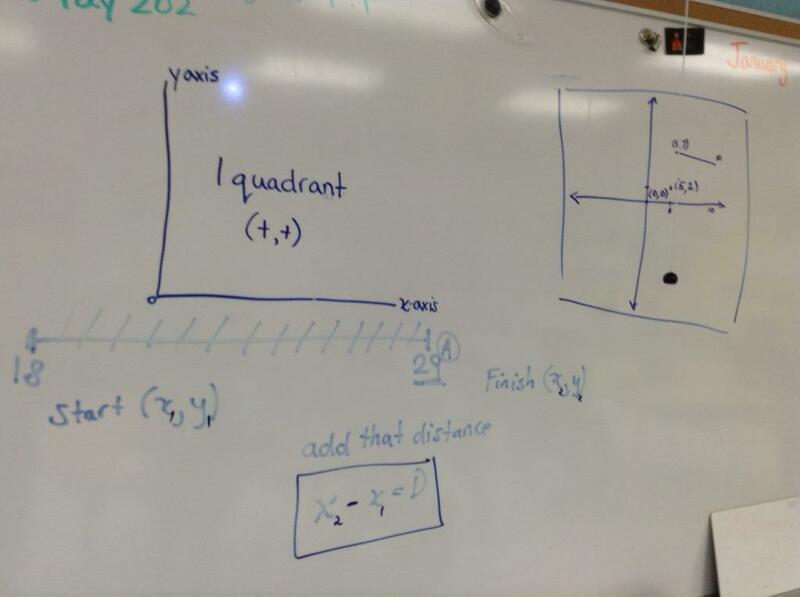 In fact without thinking about it my students learned about the relationships between adding and subtracting, coordinate grids, negative numbers, Cartesian planes, what a pixel was, and how to find the distance of a line. AMAZING!!! I hope that you attempt some coding in the classroom and if you do I would love to see and hear what you have done. There has been a lot of talk lately on “the classroom space.” Seeing all these fantastic posts has me thinking about what my ideal classroom would look like, sound like and act like ( You can’t tell that I am a primary teacher :)). I would like to think that my classroom at the moment is very close but there is always that aim for perfection. A lot has changed since I was in school. I can still remember most of my classrooms in rows with the teacher at the front of the classroom and us the students copying, practising or doing school work. I also can remember very little about these experiences. In fact the two strongest memories that I have of my school career was my grade three and four classrooms. I remember my grade three teacher because of the amazing stories that she would tell of her childhood. She was a fantastic story teller and really tried to connect with us as students. My fourth grade classroom memory is of a space unit. I remember this because I was basically told, “Jonathan, go as far as you want with this!” and I did. In many ways it is sad that I only have two really great memories of school. Some one once asked me that if you went back in time 50 years would the classroom look any different? The sad reality is no it wouldn’t. However, that doesn’t mean it shouldn’t. I think back to even how my classroom has undergone some dramatic changes since I started teaching. I will start by saying that I have always felt my classroom was a place of inquiry. Since the beginning of teaching I have been an admirer of Piaget and Vygotsky. However, my classroom space continues to evolve into more of my ideal space. Maybe I should have started with this but here is my vision. My ideal classroom is a classroom where all are contributors. Each student has a voice that is respected by peers and teachers. As a teacher I am not the wise sage that I grew up listening too but one who sets the conditions for the learning and asks questions along the way. My ideal space has places for all types of learners, not just particular sets of minds but places for all to feel comfortable in learning. This may mean quiet zones, maker spaces, work spaces (both collaboration and single desk spaces), and a carpet space. I want the classroom space to also be a positive space, where ALL are welcomed and appreciated. I think when I first started teaching I knew kind of what I wanted but not really how to get there. My first classroom was a POD. It was amazing to see no walls and four classrooms. I think if I could I would go back to this type of open space. It was amazing to see such a big space for learning. However, I think that even though I wanted a classroom where I didn’t talk too much, I think I did. It was still a place of inquiry but it was my inquiry and not the students. As my career developed so did my ability to bring students inquiry ideas into real authentic learning. Presently the my classroom is probably the closest it as ever been to my vision. My students are amazing thinkers and learners. I have amazing group collaborative spaces and singular spaces. My students don’t really see a table as their table spaces but places to work. They are on the floor, the carpet or at tables, where ever they seem to work best. At times because of the noise I even flow out to the hallway. At the same time my students feel like they can ask any question to anyone, as well as, answer questions without waiting for me to answer. Now this space did not happen over night. In fact I remember coming home in August ( I teach in a balance calendar) wondering if I would ever reach the ideal learning space. But with a lot of work both on my part and the students, I think we are well on our way of achieving it. I would love to hear your ideas of what an ideal Classroom is? What is the most important part of your classroom? Before I finish this post thought I would share some of my space with you.